Amgen's story begins in 1980 when venture capitalist William K. Bowes and his associates established Applied Molecular Genetics Inc. in California. The company achieved worldwide recognition when one of its teams successfully found and cloned the erythropoietin gene - a task involving the location of a gene on a single fragment of DNA among 1.5 million fragments of the human genome. The success of this project enabled the creation of one of the most successful drugs in biotech history - EPOGEN (epoetin alfa), used to treat anemia caused by chronic kidney disease in patients on dialysis, thereby reducing or eliminating the need for red blood cell trnafusion. Today, Amgen is one of the world's largest pharmaceutical companies, employs over 19,000 people, has revenues of nearly $23 billion, and is placed at #123 on the Fortune 500. A relatively new kind of pharmaceutical, biosimilars are essentially copies of an original drug on which the patent has lapsed. In terms of purity, molecular structure, and bioactivity, biosimilars are highly similar to their reference products, and have no meaningful clinical differences. However, biosimilars are not automatically approved by the US Food and Drug Administration (FDA), and must be subjected to the same rigorous testing as an original pharmaceutical. 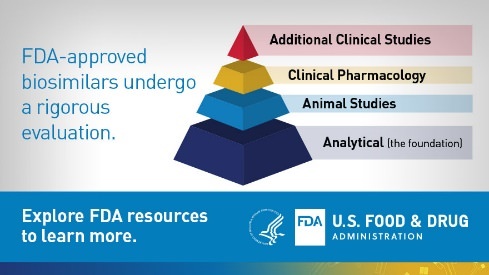 The FDA approved the first biosimilar - Zarxio - for US markets in 2015, and a total of nine have been approved to date. As biosimilars now steadily start to play an increasing role in healthcare, the pressure also increases on supply chain managers to meet the demand. However, the complexity inherent in the biosimilar manufacturing process can have a negative impact on supply chain reliability. Unlike more generic pharmaceuticals - where active ingredients are identical to the small-molecule drugs they reference - biosimilars are fundamentally more complex. "This is difficult because biosimilars are particularly large and complex molecules, and they're highly sensitive to complex manufacturing conditions," said Jeff Yant, Executive Director of Global Operations at Amgen Biosimilars. "There have been instances when our initial processes did not produce medicines that matched reference product ranges for key quality attributes. These offsets can arise unexpectedly at many different stages of process development and manufacturing. In each of these cases, we decided to go back to the lab to re-center our process through further development work." One of the key issues affecting the supply chain of biosimilars revolves around temperature control. Biosimilars are largely cold chain products, and are incredibly sensitive to mid-transportation temperature fluctuations. This leads to serious concerns when supply chains involve multiple carriers, or unexpected delays which often occur when moving across international borders. This renders supply chain contracts and methodologies both key considerations for biosimilar pharmaceutical producers. Amgen has developed a range of innovations to meet the cold chain challenge, including high-grade product barcoding, state-of-the-art tracking devices, and the hiring of specialist companies experienced in monitoring biosimilars throughout their transportation. Key transfer points in the shipment process are often the most vulnerable to issues and require specific contingency and mitigation strategies. Regulators insist on transparency in supply chain processing, which must be balanced with the pharmaceutical companies' needs for the security and safety of shipments, and the integrity and confidentiality of the brands involved - not a straightforward task in a competitive global marketplace. "The conditions we choose for our biosimilar will certainly be different from those used to produce the reference product and from one biosimilar to another," said Yant. "We need to understand and control how various conditions affect our biosimilars throughout cell line development, process development, tech transfer, manufacturing, release and distribution to ensure that the right product is delivered to patients reliably." As biosimilar pharmaceuticals become more popular among healthcare organizations, the need to address the specific supply chain challenges they present will increase in-line with demand. However, with companies such as Amgen already setting best practice in this area, other companies will have a solid trail to follow. "Amgen's supply chain is based on the hard-won experience of supplying medicines to patients for over 35 years," said Yant. "Biosimilars have required a higher degree of nimbleness. For example, these products require that we monitor the reference products' life-cycle management changes, and sometimes adjust our development and manufacturing strategies to stay competitive." You can hear Amgen's Supply Chain Director, Tiffany Cavallaro, speak at LogiPharma 2018 this September at Hilton Penn's Landing, Philadelphia, PA.